Manufacturer of Chemical Cleaning Products - Jayne Products, Inc.
We specialize in the oil and wastewater industries where we supply specialty products, including green cleaning products, as well as technical assistance. 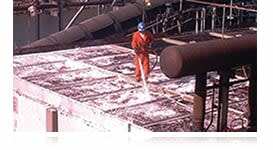 We offer two main product lines, our JPX vapor phase turnaround chemicals, and our bulk area cleaning chemicals. We have formulated and designed JPX Refinery Decontamination Cleaner, JPX-E for Cleaning Sour Equipment (H₂S), JPX-EE for Neutralizing Pyrophoric Materials, JPX-F for Fin Fan Cleaning and JPD Deodorizer for the external and internal cleanup of systems and equipment. Over the last 30 years the JPX line has created a proven track record of effectiveness, safety, and cost reduction. Utilization of the JPX line for shutdown hydrocarbon clean-up has resulted in major time and cost savings to refineries. We offer expert consultation and project management as required for turnarounds, emergency shutdowns, fin-fan cleaning and tank cleaning. The JPX line complies with stringent California regulations for emissions and effluent disposal, making it a green option for cleaning products. Our bulk area chemical cleaning products line consists of Energy Plus Red-Industrial Degreaser, Power Wash-Power Washer and Steam Cleaner, Energy Plus-Industrial Degreaser and ES-270. All of our green cleaning products are very versatile, simple to use, yet highly effective. Power Wash-Steam Soap and Energy Plus have a certification of Clean Air Choice Cleaner from the Southern California Air Quality Management District (SCAQMD), which is a very stringent clean air certification for cleaning products. We also have two chemical product lines that are used for struvite removal and prevention in wastewater and CAFO applications. Struvite can severely inhibit pumps, heat exchangers, centrifuges and pipeline operations. Struvite Remover can be used in circulation and still soak procedures to easily remove struvite. Struvite Dispersant prevents struvite deposits from forming. Other products we offer include Deodorizers-Odor Control for H²S and Mercaptans, Conntect—Turbine Cleaning, Microblaze—Spill Control, and Polarchem—Online Furnace Cleaning, if there are any other needs, please reach out and we will determine a solution for you! Our chemical cleaning products are used in a number of different industries; oil refining, wastewater, transportation, industrial, manufacturing and many more. We also ship our products worldwide. Please contact us to discuss your needs and we will have you Cleaner, Quicker, Greener in no time!